Visit Family Protection Ministries at the SCOPE/CHEA Conference in Rocklin, CA! Sign up for the SCOPE and CHEA Annual Conference! Cost: Starting at $40 a couple. Visit us at the SCOPE/CHEA Annual Conference! 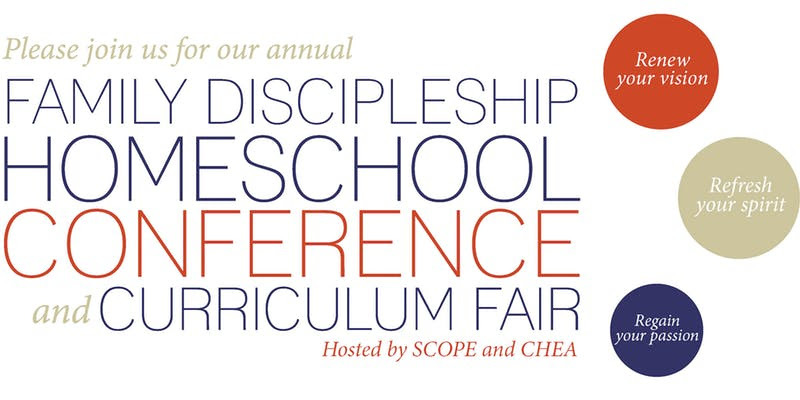 SCOPE and CHEA will hold their yearly joint Family Discipleship Homeschool Conference and Curriculum Fair at William Jessup University in Rocklin, California on June 8th-9th, 2018, and we’d love to see you there! Israel Wayne, the conference’s keynote speaker, is a homeschool graduate, author of six books, and homeschool father to nine. He writes about homeschooling, Christian Apologetics, and family-based Biblical discipleship. Come renew your vision, refresh your spirit, and regain your passion! Experience the Exhibit Hall with its vast resources of curriculum and other helpful products, with conference-only deals and specials by many of the exhibitors! This inspiring conference features speakers with decades of their own homeschool experience to share. Workshop sessions cover a wide range of subjects from practical teaching tips to parenting and discipleship. Nathan Pierce, our Legislative Liaison, will be hosting several different workshops. With all of this year’s homeschooling legislative battles, there will be much to discuss and update homeschooling parents about! We hope you can join us for these very important topics! This entry was posted in All Posts, Articles, Newsflashes by fpmca. Bookmark the permalink. Next → Next post: Remember to Vote on June 5th, 2018!